we arrived at delhi domestic airport at 18.40pm on the 30th evening.as we landed we were taken to the international airport for our drive to the village.there was tight security and loads of volunteers all through the airport.saina,jwala,and gopi bhaiya were our star attractions so they were mostly surrounded by fans all around.rest of us were at peace with our snacks and drinks which were provided to us as we waited for accreditation and stuff.being celebrities is a test of your patience i learnt that after looking at the three of them.so after we all were done with the procedures we were taken to our buses.one bus for the players and the other one for our suitcases,why so?security reasons.i had a feeling as i said bye to my bag that there was going to be some kind of jhol!! !but i told myself its cwg,how the hell will they run with your bag?? ?i left it at that.the journey to the village was around an hour.ofcourse throughout the journey we didnt have to wait for signals,dogs,traffic,pedestrians anything.we all were VIPS so everything stood stand still as we passed by.i almost fell sorry for delhi,anyways there so much of traffic here,im sure we must be getting cursed. anyways once we reached we had to wait for around 30mins for registration and getting our blocks and everything.block no 31 was our home for the next 12 days.as we entered our apartments i so hoped that everything i had heard about it was untrue and i was really pleased when i found out it was.we have a huge apartment with three bedrooms,kitchen,washing machine,tv,wifi,bed,and my most favourite thing in the flat the purple,yellow,pink quilt!it has cwg written on it,its soft and warm.i have no doubts about carrying it home with me when i leave.the flat is cool.the bathrooms are huge with water for 24hrs,hot and cold.the cleanliness levels ok,its not the cleanest place i have ever seen.i have seen flats neater and worse than this!so its alright. after discovering the flat it was dinner time.the food arena is superb.it has all the cuisines.african,italian,asian,u name it and its available 24hrs.there are fruits,desserts,drinks and every yummy thing there.imagine craving for a chocolate pastry at 3am in the night and actually having it right there in front of you,unlimited and free of cost.hahaa….that feeling cant be beaten,can it?? ?the only problem is though that there is so much to eat that you are either confused or the magnitude of it overwhelms you and you actually end up eating very less.though i am overcoming that problem now and managing to hog!i have decided every new cuisine everyday,it makes it easier that way. after dinner we were all dead and very sleepy.we came back to the flat only to realise our bags had not come.we got to know that they might come by 12am.anyhow we all slept off.the bags ofcourse didnt come at 12 they came at 3am.we went down looking like ghosts our hair all over the place.saina got her bag and went to some other flat when she saw me and realised she was headed the wrong way,ashwini went on another floor all together and got scared that she was lost until she finally found her way.i mean poor us what do you expect at 3am,in a new place.and me i was the star.all the girls got there bags and when i went there my bag was missing.i was all hyper,called gopi bhaiya he told me to relax and said that there were few other bags that had not come so i was not the only one.this is the part where i learnt that not being the only one does make you feel better for a while.he told me to sleep and not worry.which was difficult i didnt sleep well at all.any way we did get our bags at around 1 in the afternoon the next day,which meant 4 of us missed a session of practice.i have no clue why we didnt carry our bags with us in the bus?? ?security reasons,as they say! as i didnt go for practice.i explored a little bit.we have an international zone here.this place is huge.it has a disco,supermarket,bar,coffee,shehnaz hussain beauty parlour,central bank,internet cafe,gaming centre,and the best attraction an open theatre.this place is awesome you have performances here everytime right upto midnight.parikrama played yesterday.it was superb,live guitar,drums,head banging,it was rocking,ofcourse we had to retire by 9 to our rooms.but that half an hour was great.i didnt like the rahman song though somehow,i thought he could have done so much better. as of now i got a chance to see abhinav bindra,vijender singh,tejaswini the shooter as far as the big names are concerned.abhinav and tejaswini seem to be very simple people.as far as vijender is concerned he seems to be a complete rockstar.white glares,billabong shorts.extremely eye candy..;)…though havent got a chance to speak to anyone of them.hopefully will get to do that sometime.i still havent seen our tennis stars,eagerly waiting to meet them.and ya also saw the squash team.joshna chinnapa and everyone,again havent spoken to them yet. the practice hall and the main stadium werent new to us.as we have already played in both.the stadiums are great,absolutely no complaints. so as you see most of the media talk could be plain trash.with whatever resources and kind of people we have working here we have managed really well.things are amazing as i said as a player i have everything that i need to perform.gyms,swimming pools,a nice stay,great food.i have no complaints and i am all ready to come out and play! though on the sidelines of all this,there is a thought that did come to my mind as i was looking outside my window on my way to the hall.what about the life outside the cwg village?? ?what about the slums who have been pushed away homeless,and foodless?was it really right for a nation like us to spend insane amounts of money on a sports event?when there are hundreds of them without there basic necessities of food,water and a decent education??? questions i tell you,never end do they?? ?…but i guess whats life without the RIGHT questions! HaY atitititit……good one….keep postin!!! and all the best wishes dear….do well!!!! just go for it….. Were you coached by Gore Sir in Pune ? I was browsing through the Indian CWG contingent and stumbled across your name, which seemed very familiar. I used to be a player on the Pune scene long long time back. which belied her age and petite stature. If you indeed are the same person, I can now boast about having played with a sportswoman representing India at Delhi '10. If not, well, then I need to find other things to boast about. Ahhh, I have rambled enough. Good luck at the games, and I hope you bring in a medal. Ahh just read your first post, looks like you indeed are the same person! I can now gloat in solace, and have an added incentive to root for you, good luck !! i indeed played with gore sir.its really great of you to remember all this and actually writing it here.i am sorry i am very bad with my memory also 1998 is a long time back…:) though i guess you must be right.thanks for all the nice things you said,i will give my best for the medal! its must be great to experience just kind of events first hand. I know how it feels. Just enjoy. all the best and take care. awesome blog! great insight of the arena and CWG as a whole. 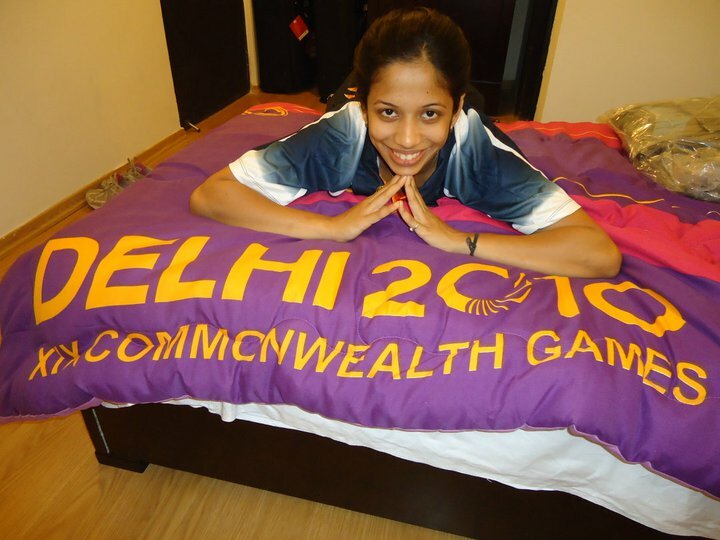 Well this is the only post or Ur's that i like the most coz it was not all about u but also about commonwealth games delhi 2010. I think a little pictures of those games would have even made it more intersting for the readers. Anyway good job done …..